My time in Kyoto was focused in the central area. It is a lot more peaceful than Tokyo for sure but it is still very city-like. Most of my expenditures were spent on delicious food but I did not mind because most restaurants were fairly priced. Most of what you will want to see is walking distance if you choose the right hotel, or a short train ride. 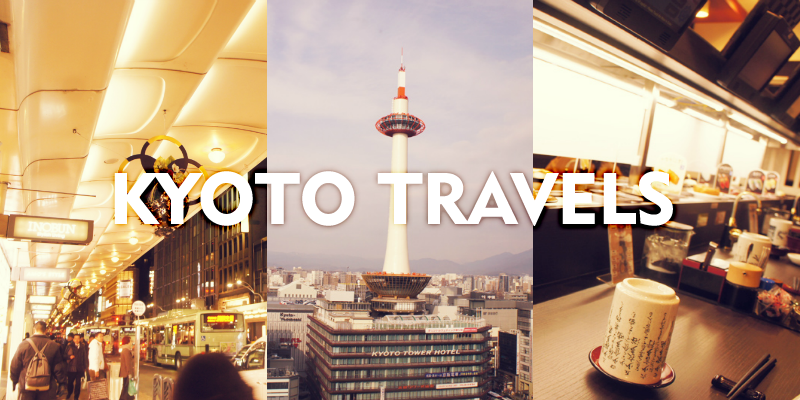 If you want to see more of Kyoto than just the central portion though, then you will need to take transportation. I would definitely recommend that you visit Kyoto along with Tokyo if you plan on visiting Japan for more than three days. On our first night there, my friends and I went out for karaoke and drinks after some exploring. The second day, we traveled to Osaka (want to know more? stayed tuned!). Originally, we had planned to see a concert for a band called Big Bang but tickets were sold out. The third day was spent visiting the Gion district. → The home of many shrines, temples, gardens, and the Imperial Palace. → Reservations can be made through Hotels.com (Get $20 Rebate with 3-Night Booking with the code REBATES14) or directly through the hotel's website. → Booked a non-smoking, a STANDARD TWIN ROOM with 2 twin beds and a cot. The room includes bathtub, toilet, air conditioning, television, direct-dial phone, refrigerator, and hair dryer. → Wi-fi is available in the room. → A safety deposit box is located at the front desk. → Cozy hotel with a European vibe. Elevators are located near the entrance. The hotel is walking distance from the metro station, Nijo Castle, Imperial Palace, Nishiki Market, and Kyoto Tower. → Train: From Tokyo, you can take the Hikari Line to Kyoto. Before you travel to Japan, you can buy a JR Rail Pass at JRPass.com (available for purchase for $279 in the US, not available to Japanese residents) that will be shipped to your home via FedEx. This may save you a lot of money if you plan to travel via train several times in Japan (can also be used in the subway for JR lines). At the airport, there is a JR Pass service area where you show them your pass you received in the mail and they will give you the actual official pass that is stamped for you to use whenever you ride the train. The option I chose was a 7-consecutive day pass with unlimited usage within the 7 days, beginning the first day you use it in order to travel from city to city in Japan. Prior to boarding a train, seat reservation is available but not required. Just show your official pass at the gate and then you are free to board a train. Destinations and train times are listed on the monitors above you in the station, but be aware that there are faster and slower trains. The JR Rail Pass can also cover your subway transportation if you are using a JR Line; just ask at the gate. If you are ever lost, just ask an attendant as most are very helpful even with little English. → Nishiki Market: is where many tourists and locals visit to buy food but make sure you go early because they open at 9am and close at 6pm. If you are out late and looking to eat dinner, there are still restaurants around the area that are open. You just need to search through the narrow streets and alleys. → Sushi conveyor belt: These are pretty awesome to try if you have never been to one. Basically, a conveyor belt goes around with plates of sushi. When you enter the restaurant, you will be seated and will have a touch screen in front of you where you can place your order. Now you may be wondering why there are plates of sushi/sashimi coming around but no one is taking it. There are certain plates that people are free to take because the chef made it for no one in particular and these plates may be color coded depending on the price. Other plates coming around may have different designs or may have a little platform for the food which will ding when it passes you (this means it is your plate you specifically ordered and can take). I am not sure if all conveyor belt restaurants are like this but this was my experience. → Ramen vending machine: Restaurants with vending machines is another fun experience you may want to try if you like ramen. People line up at these restaurants and order the type of ramen they want at a vending machine which mostly accept cash only. You will receive a receipt that you keep til a server seats you at a table or bar. Then you wait for your order. Most people who come to these restaurants literally eat and dash, compared to other restaurants when you take your time and socialize with friends. → Imperial Palace: A historical attraction known as the residence of the Imperial Family. I did not get the chance to visit it due to limited time but it is one of the major attractions of Kyoto. → Kyoto Station: A 15-story railway station filled with shops, restaurants, and a movie theatre. If you happen to be stopping by Kyoto Station, stick around for a bit because they have some great ramen spots where you can place your order with a machine and take a seat. There are also many shops inside as well as a nice view of the Kyoto Tower when you head to the top. → Nijo Castle: Another historical residence in central Kyoto but it is not as large as the Imperial Palace. → Shijo Dori: If you are planning to go shopping, Shijo Street is the place to go. The steel roof along the sidewalks are what give the street it's unique modern feel. There are also many restaurants as this was the place I went for sushi at a conveyor belt. → Yasaka Shrine: A popular shrine dedicated to the god of prosperity and health. Although I went during the day, I heard it was also night to visit at night when all the lanterns are lit up. It is also a beautiful sight when the cherry blossoms are in bloom. → Gion District: The famous geisha district of Kyoto where you can find the Yasaka Shrine, Shijo Ave, tea houses, restaurants, and other historical attractions. The Hikari shinkansen (bullet train) from Tokyo to Kyoto. Bought a bento box for the ride. There are some cute little shops and restaurants. A store filled with photobooths. Spent a couple hours in here...yep. Shijo Dori (street) is really pretty at night with all the lights. Stopped at a sushi conveyor belt on Shijo Dori! I always wanted to eat at one. Discovered a small temple across the street from our hotel. Across the temple were these interesting stones. I wish subways stations in the US could build glass sliding doors like these. A more suburban area of Kyoto. Found a bonsai tree event that my friend wanted to check out. Just place your ramen order with a click of a button! So good yet so salty. The Kyoto Tower is a popular attraction. The busy streets of Japan. The view of Kyoto station. Me in front of the Yasaka Shrine in the Gion District. Plaques to write beauty wishes on. Spotted a cute couple in their kimonos. Strolling through the beautiful area within the Yasaka Shrine. Old buildings along the road in Gion district. Enjoying some green tea and a tea house to warm up from the cold. Ending the night with the lights of the busy streets.